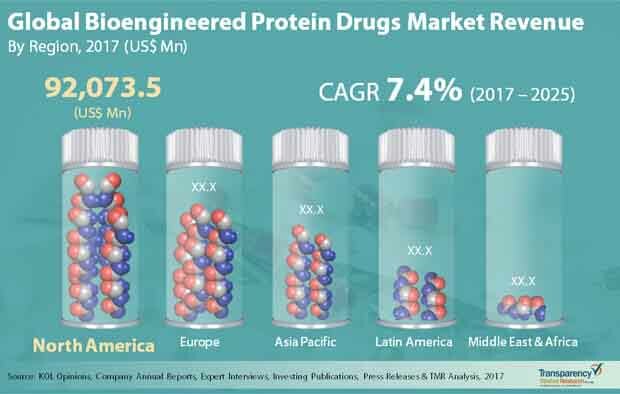 A report by Transparency Market Research predicts the global bioengineered protein drugs market to expand at a 7.4% CAGR from 2017 to 2024 to become worth US$336.9 bn by 2025 from US$177.7 bn in 2016. The global bioengineered protein drugs market can be classified into monoclonal antibodies, vaccines, and therapeutic protein based upon the type of product. The therapeutic protein segment, among them, accounts for a dominant share because of extensive activities in the therapeutic protein engineering and recombinant DNA technology products. In terms of growth rate, however, the vaccines segment is expected to outshine all other segments by clocking maximum CAGR between 2017 to 2025 because of increase in development of bioengineered prophylactic and therapeutics vaccines. From a geographical standpoint, North America leads the global bioengineered protein drugs market. In the years ahead, the region is slated is maintain its dominant position because of the rising occurrence of cancer and unveiling of innovative protein therapeutics for cancer. While loss of patents of blockbuster drugs such as Humira, Rituxan, Avastin, and Remicade, among others, are expected to deal a blow to the revenue in the market, launch of new drugs and approvals for new diagnostic tests, along with a growing geriatric population and unhealthy lifestyle will likely make up for it by inducing growth. As per the TMR report, the bioengineered protein drugs market in North America will likely register a CAGR of 7.2% from 2017 to 2025 to become worth US$161.05 bn by 2025. Though trailing North America, in terms of size, Europe is expected to lag behind all other regions vis-à-vis growth rate because of the patent loss of blockbuster drugs such as Humira, Avastin, and Lucentis and emergence of biosimilars.